My brother Dan joined me for a walkabout at our hunting property over the weekend. It was the perfect time to be there. It was hot and humid. Not much in the way of a breeze. But, surprisingly there were no pesky flies or mosquitoes. Just a myriad of native plants and busy wildlife taking advantage of such a lush setting. 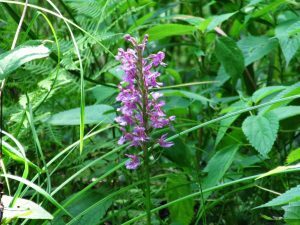 Purple Fringed Orchid (Habenaria psycodes) – This was the first time I’ve seen this plant since the last walkabout with my brother Dave, a month before he died in 2004. 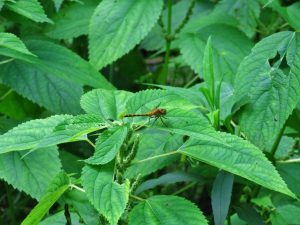 Orange Meadowhawk (Sympetrum spp) – This dragonfly seemed to follow us around as we went from one orchid to another. 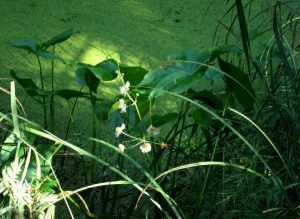 Arrowhead (Sagitaria latifolia) – The Duckweed (Lemna minor) was so thick on the pond, it looked like you could walk across it. 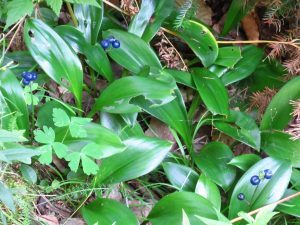 Yellow Beadlily (Clintonia borealis) – I’ve never seen the beautiful blue fruits of the Clintonia before. What a lovely color. 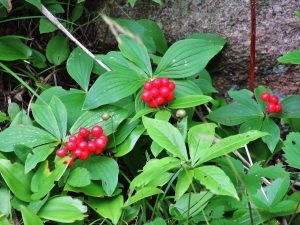 Bunchberry (Cornus canadensis) – The Bunchberry with its bright red fruit was like a carpet on the woodland floor everywhere we went. 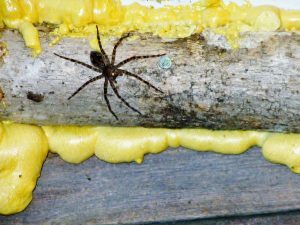 Dark Fishing Spider (Dolomedes tenebrosus) – We often see the Wolf Spider (Hogna aspersa), so seeing this big guy was a pleasant surprise. Here a Joe Pye Weed (Eutrochium purpureum) is being visited by a variety of nectaring insects. I was listening to NPR on the radio, so if you turn the volume up, you can hear a financial specialist speaking about the best way to save money for a child’s future education.